SEM of CB1190, a 1,4-dioxane degrader isolated in lab of Dr. Shaily Mahendra – guest speaker in SiREM’s Feb. 23, 2017 Webinar. Groundwater remediation of 1,4-dioxane utilizes novel applications such as Tree Wells. Bioaugmentation of root zones may be a viable option for enhancing 1,4-dioxane biodegradation says Ron Gestler. The US Environmental Protection Agency (EPA) announced in late 2016 that 1,4-dioxane was included on the list of the first 10 chemicals slated to receive safety reviews under Toxic Substances Control Act (TSCA) reform. Making the TSCA “Top 10” highlights concerns over 1,4-dioxane, a probable carcinogen commonly detected in groundwater due to its widespread use as a solvent and solvent stabilizer for 1,1,1-TCA. The high solubility of 1,4-dioxane in groundwater leads to large dilute plumes, often larger than the plumes of the solvent to which it was originally added. Bioremediation, generally considered a cost-effective strategy, is increasingly being applied to 1,4-dioxane contaminated groundwater. While anaerobic biodegradation of 1,4-dioxane by iron reducing bacteria in the presence of humic compounds has been reported1, it has not been widely observed in-situ. Most research efforts have focused on aerobic 1,4-dioxane biodegradation via co-metabolic or metabolic degradation pathways. Aerobic cometabolic bioventing strategies often utilize the addition of oxygen and alkane gases to groundwater; SiREM has performed treatability studies to optimize this approach using both methane and propane2. 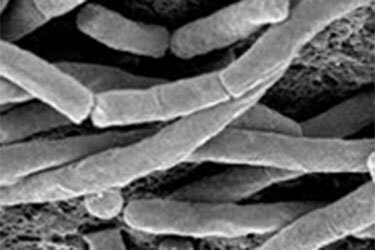 Bioremediation of 1,4-dioxane by aerobic energy yielding pathways has shown growing promise with the identification of Pseudonocardia dioxanivorans CB1190 by UCLA professor Shaily Mahindra3. The name dioxanivorans literally means “devours dioxane” and CB1190 contains enzymes allowing it to use 1,4-dioxane as a carbon and energy source. In 2016, SiREM scaled up 100 liters of CB1190 for use by AECOM for a bioaugmentation pilot test application for 1,4-dioxane. SiREM is also scaling up and characterizing another culture that is currently capable of degrading 50 mg/L of 1,4-dioxane. Preliminary characterization suggests this culture has distinct microbial populations compared with CB1190. Testing for 1,4-dioxane functional genes is also available (See Technology Spotlight: Gene-Trac® 1,4-Dioxane). In 2016, SiREM scaled up 100 liters of CB1190 for use by AECOM for a bioaugmentation pilot test application for 1,4-dioxane. Despite much progress, the use of aerobic cultures in groundwater is not without challenges. Sandra Dworatzek, a Senior Manager at SiREM, sums it up this way: “Overcoming the challenges of aerobic bioremediation are dependent on field design approaches for effective distribution of the culture and maintaining aerobic conditions in dilute 1,4-dioxane plumes.” These challenges may tend to favor ex situ approaches, such as bioreactors, where oxygen and a steady supply of 1,4-dioxane can be delivered to the system. Recognizing this, one way to employ a bioreactor strategy at 1,4-dioxane sites is to use the TreeWell ™ system, an innovative engineered phytoremediation technology. 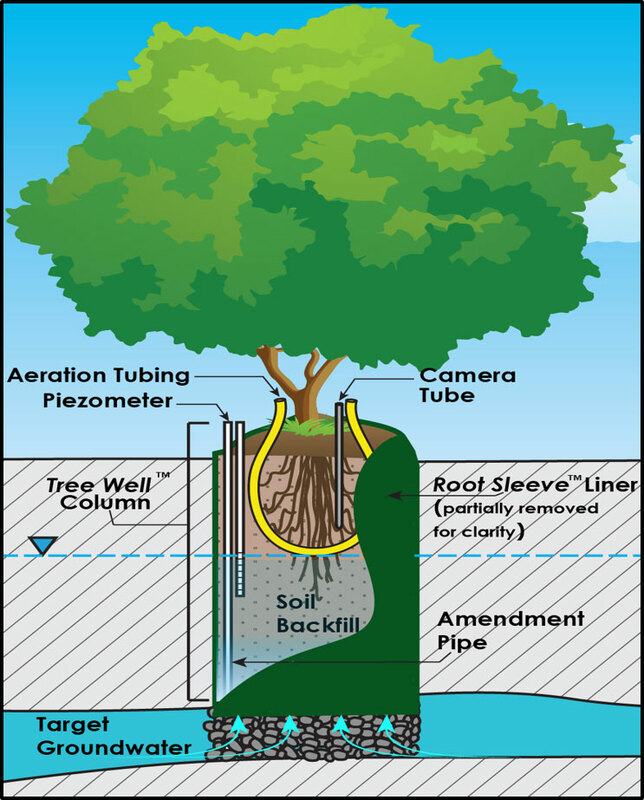 The patented TreeWell system targets impacted groundwater horizons by directly connecting plant roots to the aquifer unit of interest, conveying impacted groundwater to the plants through a specially designed soil column. Ron Gestler, one of Geosyntec’s phytoremediation practitioners, has successfully used the TreeWell system at multiple 1,4-dioxane sites. In these engineered phytoremediation systems, the plants extract impacted groundwater through root uptake and help maintain highly aerobic conditions in the root-zone, creating potentially ideal conditions for establishing a bioreactor for 1,4-dioxane biodegradation. Ron sees the potential of bioaugmentation to supplement the major 1,4-dioxane phytoremediation mechanism, which is evapotranspiration through the plant’s leaves2. Bioaugmentation of soils in the root zone with CB1190 would help to quickly establish a robust population of 1,4-dioxane degrading microbes in the TreeWell soil column, increasing the extent of biodegradation and reducing contaminant transfer to the atmosphere. While much work remains to be done, a growing knowledge of biodegradation pathways, applied remediation strategies, laboratory methods and bioaugmentation cultures for 1,4-dioxane means the future is looking bright for enhanced bioremediation of this challenging emerging contaminant. 1 Shen, WeiRong , Hong Chen, Shanshan Pan. 2008. Anaerobic biodegradation of 1,4-dioxane by sludge enriched with iron-reducing microorganisms. Bioresource Technology. 99(7) 2483–2487. 2 Sadeghi, Venus Cometabolic Bioremediation of TCE and 1,4-Dioxane with Methane and Oxygen at Air Force Plant 44. 2015. Platform Presentation Third International Symposium on Bioremediation and Sustainable Environmental Technologies, Miami Florida, May 18-21, 2015. 3 Mahendra, S. and L.A. -Alvarez-Cohen. 2006. Kinetics of 1,4-Dioxane Biodegradation by Monooxygenase-Expressing Bacteria Environ. Sci. Technol. 40, 5435-5442.